Despite laws in Hawaii protecting manta rays from being killed or captured, 1 of 10 manta rays observed at Olowalu suffers from an amputated or severely damaged cephalic fin caused from entanglement in fishing line. The cephalic fin is an important appendage used to guide water and plankton into their mouths when feeding. When they encounter fishing line, most likely at night, they lock their cephalic fins together and begin to roll to try to get free, only wrapping themselves tighter into the line. They eventually break free but the wrapped fishing line begins to saw its way through the flesh over weeks and months eventually cutting through the entire fin or rendering the fin useless. Within their large home ranges, manta rays can focus heavily on specific areas for the removal of parasites, social and reproductive behaviors, and for feeding. Identifying those critical areas can be difficult. By taking advantage of the University of Hawaii’s vast network of bottom mounted acoustic receivers dispersed throughout Maui County waters, manta rays tagged with acoustic pinger tags can be tracked, with each tag emitting it’s won unique signature. With tag batteries lasting over a year, much can be learned about an individual manta ray’s preference and need for certain habitats and better understand which habitats overlap with areas of high risk of entanglement. In addition to acoustic tags, satellite tags can provide much greater fine-scale resolution of habitat use with instantaneous results. 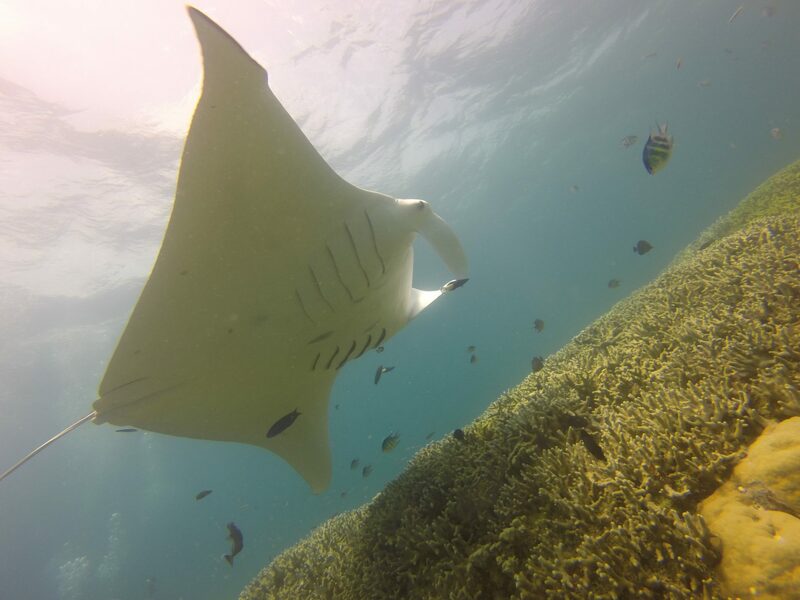 Manta rays often travel just below the surface allowing a tethered satellite tag antennae to break the surface and transmit information about the manta rays location and dive profile independently of the location of the acoustic receivers. The data can be retrieved and analyzed immediately, providing high-resolution information about habitat use in a very short period of time. Manta rays are mesmerizing animals. With wingspans reaching over 22 feet across and possessing one of the largest brain to body ratios of any fish, their curiosity rivals that of marine mammals, often investigating boats, divers, and snorkelers. These gentle giants have captured the hearts and minds of people all over the world. When sustainably managed, manta ray commercial dive operations have generated millions of dollars in revenue for small communities. Unfortunately, manta rays mature late and females only have a single pup every 2-3 years. This means populations grow very slowly and can be severely threatened by the loss or removal of just a few individuals. In many parts of the world where manta rays are hunted or caught as by-catch, populations have been decimated in a matter of a few months. To preserve and protect Olowalu’s manta ray population, we need to understand how these entanglements are occurring and quickly develop and implement an effective management plan to eliminate the threat. Meet Mahina, which in Hawaiian means “moon”. Mahina is a great survivor, a Mom, and one of the most frequently spotted members of the Maui manta population. She has been spotted pregnant four different times, with as many as twenty-seven males in hot pursuit hoping for a chance to mate with her, the highest number of suitors every recorded! But Mahina and her kind are in trouble and they need YOUR help. In 2008 Mahina was entangled in fishing line that was successfully removed, but many others are not so lucky.